The Van Mark T1050 portable siding brake is used to bend aluminum trim coil (3003 H14), light steel, and copper for residential siding, roofing, window, roofing and gutter installation. 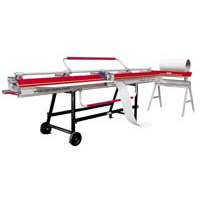 The T1050 is lightweight and portable and very easy to operate and maintain. Ideal for the basic bending needed to install siding and windows, the T1050 bends metal up to 130 degrees. It is an exceptional Entry level or basic brake and very popular in the DIY markets. Van Mark makes the strongest, most durable and highest quality jobsite tools in the industry.